December 2, 1980. The segment from its source, including all headwaters and an unnamed tributary from Porcupine Lake, within the boundary of the Arctic National Wildlife Range. Wild — 80.0 miles; Total — 80.0 miles. The 95-mile long Ivishak River flows north, through the Philip Smith Mountains and the northern foothills of the Arctic National Wildlife Refuge, to join the Sagavanirktok River on the coastal plain south of Prudhoe Bay. Fed by glaciers in the headwaters area, the Ivishak develops an increasingly wide, braided floodplain typical of northern Alaska rivers. It winds past year-round flowing springs, ice fields and glaciers in hanging valleys. Birdlife most likely exceeds 100 species. 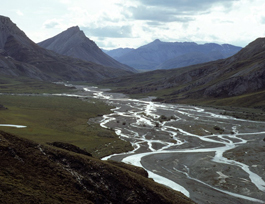 The river is designated wild where it flows through the Arctic National Wildlife Refuge.